Although the anime is only 25 minutes in length, the message and feeling it conveys amounts greatly even after the show has ended. How is this so? Hoshi no Koe ~The Voices of a Distant Stars~, using full 2D and 3D digital animation, is a story of a long distance love and mail messages between a boy and girl. Set in 2046 after the discovery of the ruins of an alien civilization on Mars, man has been able to make leaps in technology and is planning to send an expedition into space in the next year. Nagamine Mikako and Terao Noboru are junior high school students. However, while Noboru will be entering senior high next winter, Mikako is selected to join the space expedition. Set in a futuristic place in the year 2046, the story is about the mutual relationship between a boy and girl in which the girl (Nagamine Mikaki) is sent on a mission in space to investigate the aliens that have come into contact with humans. As Mikako travels further and further into space, the distance on communication becomes longer and longer. Somehow, this anime reminded me of 5 Centimeters per Second (they both were by the same company but Voices of a Distant Star was released before 5 Centimeters per Second). There really isn't much of a story here to tell, but rather we learn a bit about the character's past as well as their current feelings, emotions and thoughts about each other. The story touches deeply into one's heart, and if you think hard enough, you will come to understand the anime in which the ending will definitely bring you to tears. The art was relatively limited in detail but for a early 2000s anime, it was astoundingly well illustrated. Even the special effects and the depth of space that the anime brings out is certainly highly detailed to some degree. 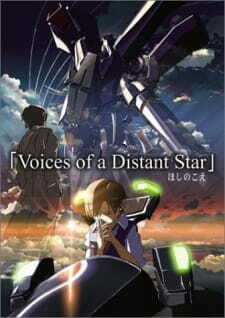 However, unfairly comparing this to say a sci-fi anime that was released recently, you can say that Voices of a Distant Star definitely lacks the fine detail and texture that anime today have. The characters were pretty generic in presentation, but that was probably intended as to give an "ordinary life" type outlook. The voice acting was decent for both characters. They both were somewhat melancholy and quite boring to listen to (if you are not into dramatic monologue talk. That said, the anime only did consist of two active characters (you can guess who) and so I guess the production team did not focus on sound as the main selling point of this anime. I think there was not a opening theme song, but there was a rather melancholy ending song to suit the theme. I found that the background music was well selected and was full of emotion that affected viewing experience. Not much can be said about Mikako and Noboru. The anime only shows the two of them and so throughout the 25 minutes you will be hearing them both thinking and talking to themselves. The anime does spend some time explaining the situation and the character's backgrounds but that is mostly though monologue by the characters themselves. Overall, the ending did bring some tears to my eyes as it reflected greatly on society today. Simply put, the story is basically about childhood friends that slowly drift apart and stop communication after a while. If you put that into perspective, it is quite sad and tragic. Simply told and presented. There is some limited action (fight scenes with aliens), but mostly it is all monologue. It was well designed and illustrated for a early 2000s anime. Decent voice acting but with well suited background music to complement appropriate scenes. You can;t expect much character development in a 25 minute anime, but the story does reveal the situation slowly. Well, it did make me teary (which is a good sign for these type of anime), if it did not, this would have been a failure for a story that is meant to invoke sadness into the viewers. It did a quick but effective job in captivating the audience into showing feeling towards the characters portrayed in the anime. It was well done. EA has released the first teaser trailer for the mobile version of Need for Speed: Most Wanted, which is due to land on Android and iOS in the next few weeks. It's a short, 30-second affair showing some gameplay highlights, including the kind of nitrous-fuelled disregard for road safety we've come to expect from one of EA's leading racing franchises. As we'd expect from a big-budget title, it's visually impressive, and we hope high-powered Android handsets will be able to enjoy this level of eye candy when the game lands on Google Play later in October. Check out the trailer for yourself above. We'll keep you updated when the game eventually arrives on Google Play. Microsoft Corp opened its Windows 8 operating system for pre-orders on Friday, setting the price for the full version of the software at $70 for a DVD pack. Users can also wait for launch on October 26 to download the system onto their computers for $40, an offer price that will expire at the end of January. Shoppers can reserve the software pack at Microsoft's own stores, Amazon.com, Best Buy, Staples and elsewhere. The price tag is significantly lower than the current price for a comparable version of Windows 7, which costs $200. Any customer who buys, or already bought, a Windows 7 PC between June 2 and the end of January 2013 will be able to get an upgrade to Windows 8 Pro for $15, a move designed to prevent a drop-off in PC sales before the launch of Windows 8. Microsoft also said PC makers such as Acer, Asustek, Dell, HP, Samsung and Sony were also now taking pre-orders for machines with Windows 8 pre-installed. The world's largest software company did not mention its own Surface tablet PC, which is expected on the market at the same time as Windows 8. Microsoft has not revealed specifications or price of the product it hopes will challenge Apple Inc's iPad. The official artwork for Ubuntu 12.10's sleeve and disc has been added to the Ubuntu Wiki. There is no dramatic departure from the last few sets releases. The same ‘front’ image is used on the ‘disc’ itself, and the back page once again uses the default wallpaper as its backdrop.